BUENOS AIRES, Argentina—Leaders of the world’s top economies agreed for the first time to reform the 23-year-old World Trade Organization (WTO), backing President Donald Trump who has repeatedly called the organization a “disaster.” In this and other measures, Trump came away from the high-profile meeting with a win. 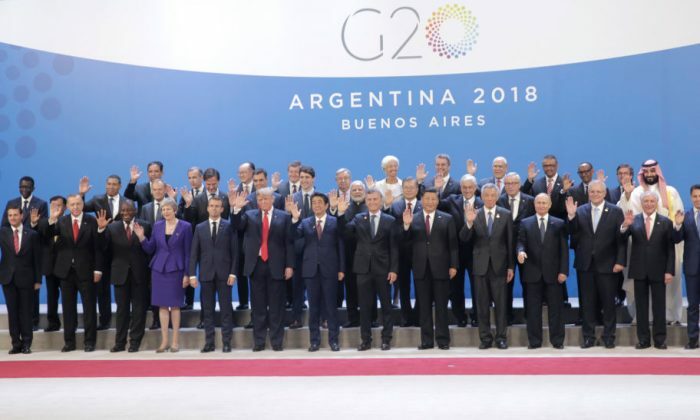 At the G-20 summit in Buenos Aires, Argentina, leaders ended their two-day meeting on Dec. 1 with a communiqué that acknowledged that the world trade body needs fixing. Trump earlier criticized the organization for its outdated rules, which have become dysfunctional in regulating global trade disputes. The Trump administration has recently blocked the appointments of new judges to the WTO’s Appellate Body, paralyzing the organization’s dispute-settlement system. However, it’s not the first time the United States has made such a move. The Obama administration also blocked the reappointment of judges because of decisions with which Washington disagreed. Trump had earlier threatened to withdraw the United States from the WTO, claiming it treats his country unfairly. “We lose the lawsuits, almost all of the lawsuits in the WTO,” he claimed, during an interview with Fox News. China, meanwhile, managed to exclude the phrase “unfair trade practices,” language it had opposed at the Asia-Pacific Economic Cooperation summit in November over concerns it was singling out Beijing. At the recent APEC summit in Papua New Guinea, leaders failed to agree on a joint statement for the first time in group’s history due to the divisions over the trade language. The G-20 communiqué also addressed rising concerns with respect to financing practices, including infrastructure funding. “We call on the IMF and World Bank to work with borrowers and creditors to improve the recording, monitoring, and transparent reporting of public and private debt obligations,” said the summit statement. The Trump administration has been a vocal critic of Beijing’s ambitious international-development plan, the Belt and Road Initiative (BRI). It has been particularly concerned at how the BRI is a “debt trap” for many emerging countries in Central and South Asia. To connect Asia, Africa, and Europe, the BRI involves massive construction projects that are financed mainly through a wide range of Chinese local government and state-controlled institutions. Critics worry that China is using “debtbook diplomacy” to gain political and economic leverage over other nations or their silence on human-rights violations. “We will work towards enhancing debt transparency and sustainability, and improving sustainable financing practices,” said the statement. Trump, who made trade a central issue for his G-20 agenda, held bilateral meetings with key trading partners at the summit. He attended the first trilateral meeting between the United States, Japan, and India. The leaders discussed strengthening the partnership and working towards realizing a free and open Indo-Pacific. The meeting was seen as a cooperation against China, since all three share concerns about Beijing’s rising power. Trump had faced criticisms on his trade policy from European leaders including Merkel at this year’s Group of Seven summit held in Canada in June. The German leader mocked Trump by posting a photo on the internet staring down the U.S. president during a summit meeting, which turned into a diplomatic squabble. “We’ve made tremendous progress at the G-20 with many nations,” Trump said. In addition, Trump held a bilateral dinner meeting with Chinese leader Xi Jinping, where both sides declared a trade truce. Xi agreed to make structural reforms within the next three months to address Washington’s long-standing concerns about the communist regime’s unfair practices such as forced technology transfer, intellectual property theft, and non-tariff barriers.